Secure Rotary Files come standard with a key lock to secure contents. Adding another layer of security to a standard key lock is our astragal locks, which are a full length hinged, heavy-duty steel straps swing over the space between the rotary files and post to securely lock unit. The user supplies their own pad-lock. Astragal locks are available for new and existing Rotary Files. Stand in front of a 3, 4, 5, 6, 7, or 8-tier Rotary File and rotate the file and within three seconds another complete file is in front of you. Thats "Speed Filing." The rotating design of rotary files allows dual access to your documents from one or both sides. 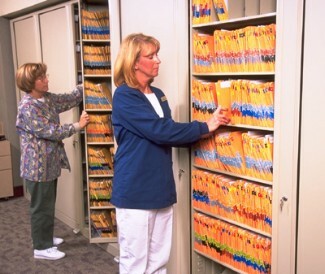 Rotary Files are designed to expand when your storage needs have reached capacity. Additional add-on units can be attached anytime. Rotary file units can be built into an alcove, used as a room divider, configured back-to-back for maximum capacity or arranged with panel systems of any height. 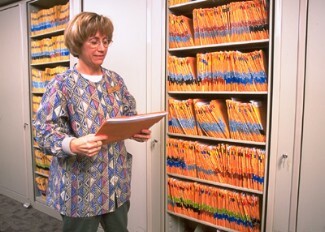 Rotary Files can even be positioned through a wall or panel, and closed backs can be applied for high security areas. 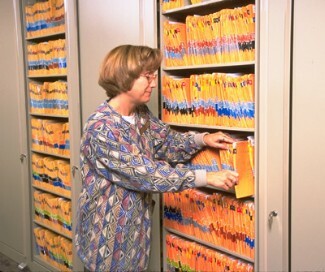 Outstanding versatility is another reason why rotary files are slowly but surely replacing other types of file cabinets. With just a quarter turn, rotary files are fully closed and securely locked. There are rotary file units for letter, legal EDP and A4 sides. Start as low as a 3-tier and go all the way up to 8-tier. Choose from an unlimited palette of paint finishes.